I just got my copy of Jen’s new book and LOVE it for so many reasons!! 1. Her writing here, as in all her books and her assessment kits, is so clear and easy to follow. 2. She gets reading and assessing and using the data to drive instruction and she has a way of explaining these important teacher tasks for both the novice and the expert teacher. 3. She emphasizes how to best instruct students in literacy using a student’s strengths to build on and then shows how to move a student so to deepen their literacy skills. 4. She knows this work is not easy so she includes in sidebars all the great books a teacher needs to read in order to do this important work. 5. 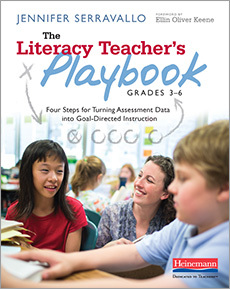 The forward to the book is written by my favorite literacy leader, Ellin Keene! I recommend this book for ALL teachers of literacy! !